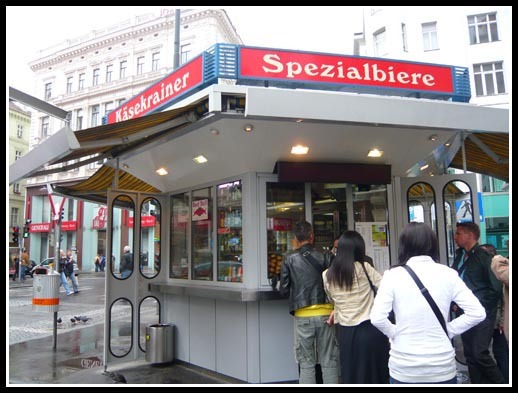 According to Lonely Planet, there is a sausage stand in Hoher Market that attracts people from all walks of life with its consistently good sausages, central location and long opening hours. This is evident from the long queue when we ordered our sausages. 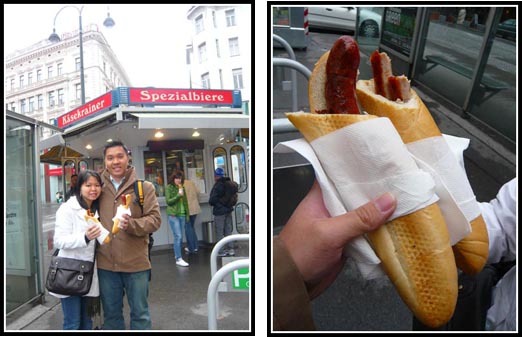 We tried the Kasekrainer, a hearty sausage infused with cheese. It can be quite a messy affair so prepare your tissues. 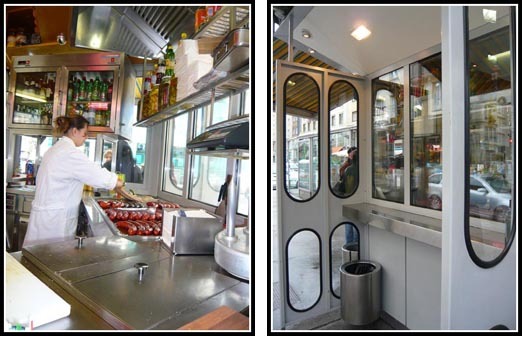 There are 2 ways you can eat it – as a hotdog (€3.50) or with bread and sausages cut up (€3.20). We chose the hotdog since its the more authentic Viennese way of eating and the latter looked like what you would feed a pigeon :-p We also ordered a Currywurst (a curry sausage) for €3. To avoid the cold winds, you can choose to dine in one of the shelters in the stand. Good to eat. I will try in next month. I like your articles, you and team very good. cheese in a sausage? ?, is it anything like a cheeze dog?. but a curry sausage has to do it for, i think i might look for a holiday now :P.
That sound weird, cheese in a sausage..
Austria is a different world, no matter what it is said about it, they are very close to german lifestyle and living standards. One of the best place to live on the Earth, in my opinion! OMG! this is soooo yummy and soooo long. I’d like to try this asap, lol!